So, I baked a pretty fabulous cake, and just had to share the recipe! I randomly got sent some pears on behalf of Australian Pears a little while ago (thanks guys!) and decided that the only responsible thing to do was to bake a cake with them! N.B. 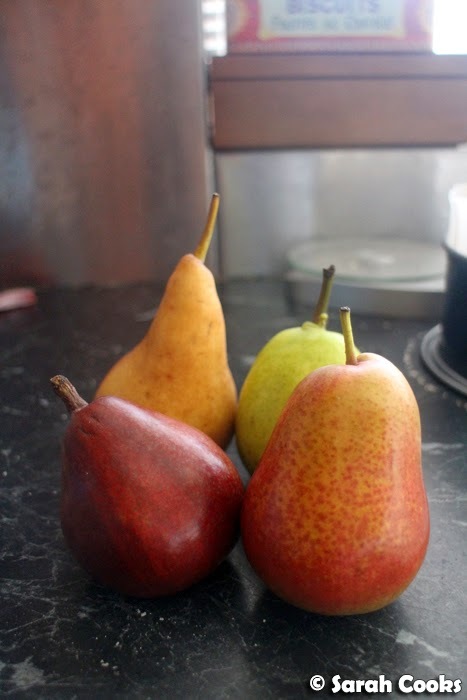 three of the pears are ones the pear people sent me; the red one on the front left was a red anjou pear that I bought myself at the supermarket because it looked pretty! 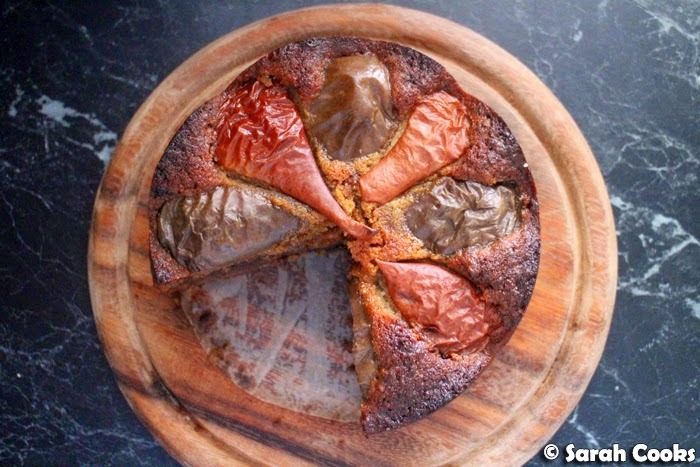 I initially thought of baking a plain butter cake and topping it with the pears (similar to this very fast nectarine and blackberry cake), but I wanted something a bit more unique that would really complement the pears, and I definitely wanted to include dark chocolate. 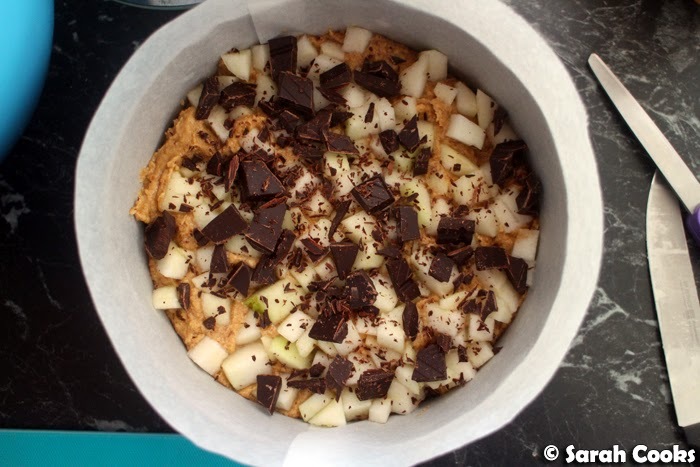 (Pears + dark chocolate = yumtown). 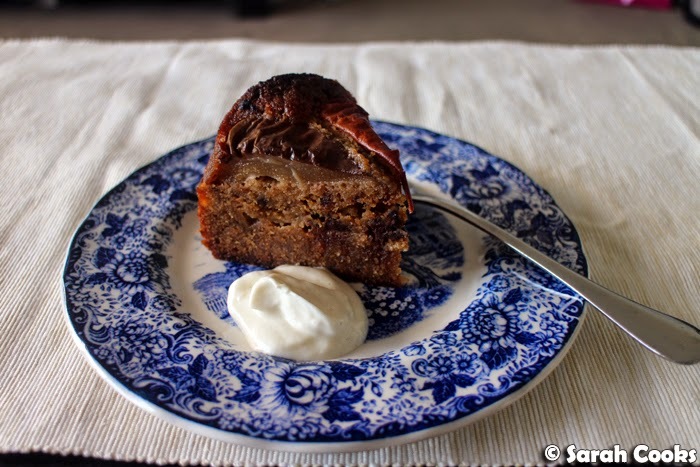 I found a few recipes online, and after a quick poll among my friends, this pear, chocolate and cardamom cake from Delicious Everyday won. Doesn't the name itself just sound heavenly? It's an almond-meal based cake, with just a touch of plain flour. 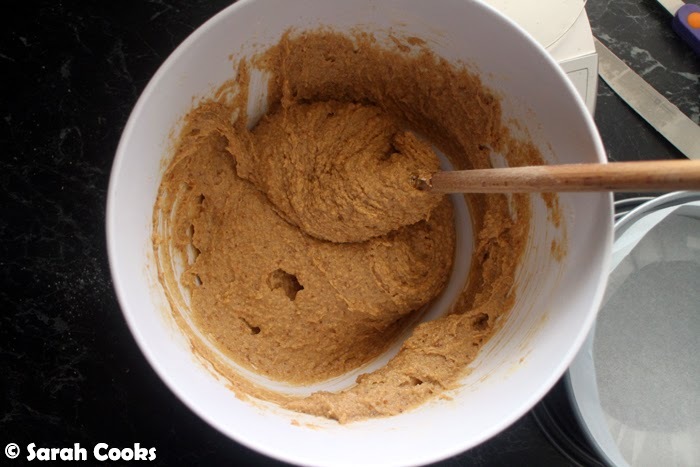 (If you're baking for coeliacs, I think you could go gluten free flour in this instance without too many problems - as it's such a small amount I can't imagine that a substitution would adversely affect the texture of the finished product). There's also brown sugar, eggs, and a LOT of butter. I adapted the recipe by scaling it down by two thirds (maths skills, I haz them), using coconut sugar instead of regular brown sugar, using way more pears, and baking it all at once rather than in two stages. Incidentally, I often bake cakes in my 18-cm springform tin. I love it! And baking a small cake means I'm less likely to eat too much of the cake over the week! Here's the first layer, all studded with pear cubes. And the dark chocolate chunks! You can definitely taste the chocolate in the end product, so I chose one that I really enjoy eating and chopped it by hand. And here's the second layer of cake batter, topped with quartered pears. Ordinarily I think I'd peel the pears (similar to an Apfelkuchen, sehr fein), but seeing as I had different coloured pears I thought leaving the skins on would be prettier. Interestingly enough, after baking, the red pears turned khaki green and the yellow pears turned red! This is such a wonderful cake! 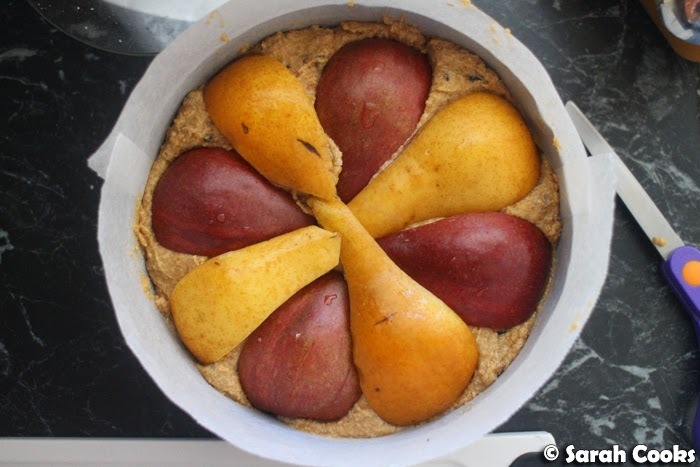 Because I really, really packed the pears in (three pears in an 18-centimetre cake! ), the cake was incredibly moist, almost like a pudding. If you prefer a more conventional cake texture, simply use half the amount of pears (and start checking for done-ness at 45 minutes). The graininess of the pears is echoed by the almond meal in the batter, and I love the pops of dark chocolate. The hint of cardamom adds a deliciously intriguing note - so don't be shy! (Speaking of which, based on the success of my friend Alaina's clove and chocolate pumpkin bread, I think you could happily use ground cloves instead of cardamom in this cake!) I served the cake in thick wedges with dollops of vanilla yogurt on the side. Enjoy! 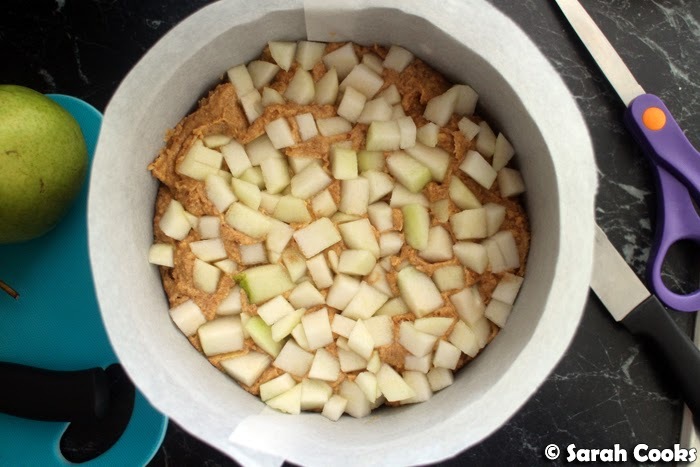 Preheat the oven to 160C and line an 18 cm or 20 cm springform cake tin with baking paper. Beat the butter and sugar in the bowl of an electric mixer until the sugar is completely dissolved and the mixture is pale and creamy. Add the eggs and beat until combined. Gently mix in the almond meal, flour and cardamom. Place half the mixture into the prepared tin. Peel, core, and dice one pear. Sprinkled the pear cubes over the mixture in the tin. Sprinkle over half the chopped chocolate. Add the remaining chopped chocolate to the remaining mixture and stir to combine. Pour this mixture into the tin and use a spatula to gently spread it out evenly. Cut the remaining pears into quarters and cut the core out. Arrange the pieces over the mixture in the thin and press down gently. (You may need to trim the pears to be smaller depending on the size of your pears). Bake for 1 hour to 90 minutes, or until cooked when tested with a skewer. 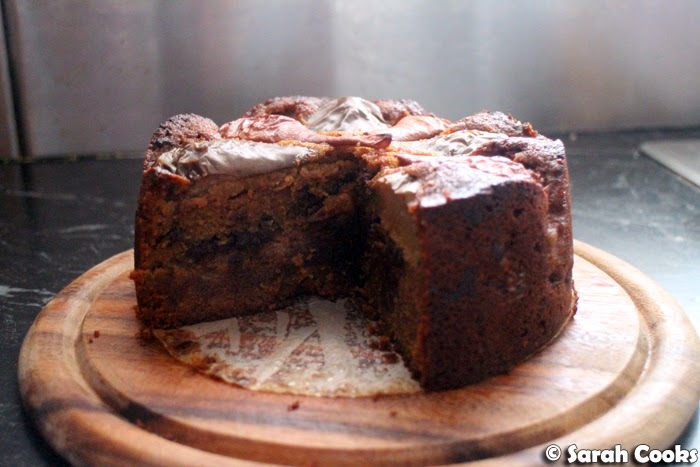 Cover the cake with a piece of foil if it is browning too quickly. Spring the cake free and allow it to cool on a wire rack before cutting into thick slices. Serve with double cream or vanilla yogurt. Sarah was sent complimentary pears from Australian Pears. Gotta love a cake/pudding. It almost seems healthy with that many pears!